Earth Book Review: - Universe Galaxies And Stars Section. Uncentering the Earth by William T. Vollmann. Fighting the good fight. David meeting Goliath. Persevering against the odds. These phrases give images associated with a valiant struggle to succeed. William T. Vollmann in his book Uncentering the Earth shares his thoughts on the struggles of Nicholas Copernicus in relocating the Sun to the centre of the solar system. Though Copernicus did not undertake any physical fight, there certainly was conflict while he was promoting and publishing his ideas. As most people well know, Nicholas Copernicus moved the centre of our existence from being geocentric, or Earth centred, to being heliocentric, or Sun centred. This wasn’t a minor issue in physics, as the power of the day, the religious practitioners, proclaimed a geocentric existence. Further, they held significant power in the land. Their dictates, no matter how unreasonable, were meant to be law. Hence, anyone questioning their suppositions also questioned the very basis of the church. Thus, Copernicus, though well motivated, understood the dangers of his postulation and did not publish until he was near death. Presumably he saw the first issue on his death bed, and there his good fight ended and heliocentricity began returning to the fore. Vollmann, in his book, reviews the efforts and accomplishments of Copernicus by reviewing his six volume publication, 'On the Revolutions of the Heavenly Spheres’. Vollmann comes from a literary rather than scientific background, hence he doesn’t try to reset the many pages of mathematical proofs and expositions. Rather he says, 'Copernicus was happy if his values were accurate to within 10 degrees’. Using this as a basis, Vollmann instils into the reader a sense of the magnitude of Copernicus’ effort. As chief protagonist, Vollmann picks Ptolemy. It is Ptolemy’s epicycles and equants that unsettled Copernicus who believed in perfect circles. Vollmann argues that Copernicus accepted the church’s directions but thought to bring astrology closer to reality by building tables and formulae with greater accuracy. It just so happened that Copernicus choose a position near the Sun with which to establish his perfect circles thus, as the book’s title states, he uncentered the Earth. 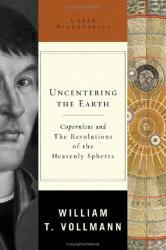 In neglecting the mathematics, Vollmann concentrates on Copernicus’ struggle in separating fact from belief. To do this, he vividly portrays the hardships and simple lives during Copernicus’ times, especially with the expectation to follow (church) orders. This is all the more true given that Copernicus was a minister. As if to emphasize the struggle, Vollmann re-introduces ancient lore with the 4 elementals and hw shows the simple beauty of astronomy that involves 7 spheres. By doing this, Vollmann challenges the reader to accept the simplicity of Ptolemy’s designs and thus Copernicus’ corresponding struggle to change the belief. As Vollmann puts it, Copernicus had to ’struggle to free human mind(s) from [a] false system’. Vollmann treats and calls his work an exegisis. The first half of his book goes through the first volume of Copernicus’ publication. Vollmann follows a pattern in his review. 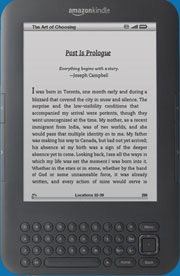 He considers the contents of some or all of a volume. Then, in a following chapter, he brings in thoughts from today and also from many years before. For example, at one point he acknowledges Copernicus’ view that the Earth, if not at the centre, may therefore have motion. He then goes on to describe how previously the four elementals meant that the Earth (i.e. the rock), being the heaviest, must be stationary at the centre hence having no motion. He then goes on to discuss motion, acceleration and radial velocity, and Newton, who made motion relative. Through comparative exercises such as these, Vollmann ably shows the struggles which Copernicus and any avant-garde individuals must undertake in their endeavours to enlighten followers. Though Vollmann could have taken the high road and proclaimed his exegisis as exemplary, he happily doesn’t. He self depreciates, calling his work an 'incomplete crib of an unreadable, error-ridden soliloquy addressed to a future which its author might have fled’. But these and other such comments bring light to a serious and sombre subject. With excellent choices of words, colourful expressions and a simple yet adequate set of illustrations, this is an excellent book recounting the spirit of humanity and its sense of perseverance. This book is for keeping in a personal library for continual referral and reflection. Background knowledge of notable Astronomers and philosophers would help the reader, as well as a bit of understanding of trigonometry. Nevertheless, lack of these won’t hamper a delightful read. Moving the Earth about may be next to impossible, but it was Copernicus who achieved this feat. Though, of course, the Earth never changed in its path, through the efforts of Copernicus, people’s perception of the Earth and the universe did change. William T. Vollmann, in his book Uncentering the Earth prints an exegesis and provides for some sound reflection on humanity’s progress.